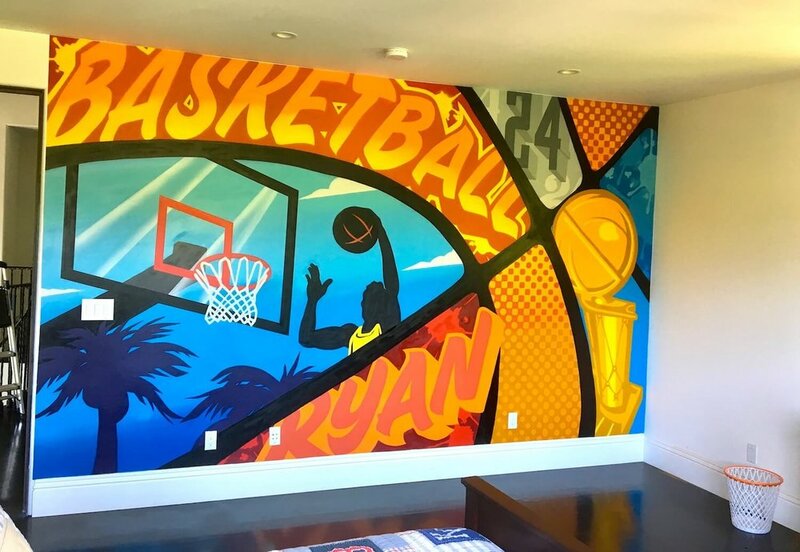 Commissioned, custom murals, co-created by you and our team of USA based, professional graffiti artists – muralists – street artists & urban contemporary artists for hire. The Mural Co. is an award-winning creative mural agency specializing in commissioned large-scale interior/exterior murals, graffiti art, street art & urban contemporary art installations for offices, businesses, centers, buildings, shops, cafes & restaurants, homes, events, live painting and more. Our passion is to create captivating, culturally relevant murals that enhance & transform spaces, engage audiences, and activate brands. Each piece of artwork we create is original, hand-painted and custom designed from your vision – everything is possible! Grown out of The San Francisco Bay Area, our professional team of graffiti artists are available for hire worldwide. They say a picture is worth a thousand words - here are some words about our pictures (murals)! 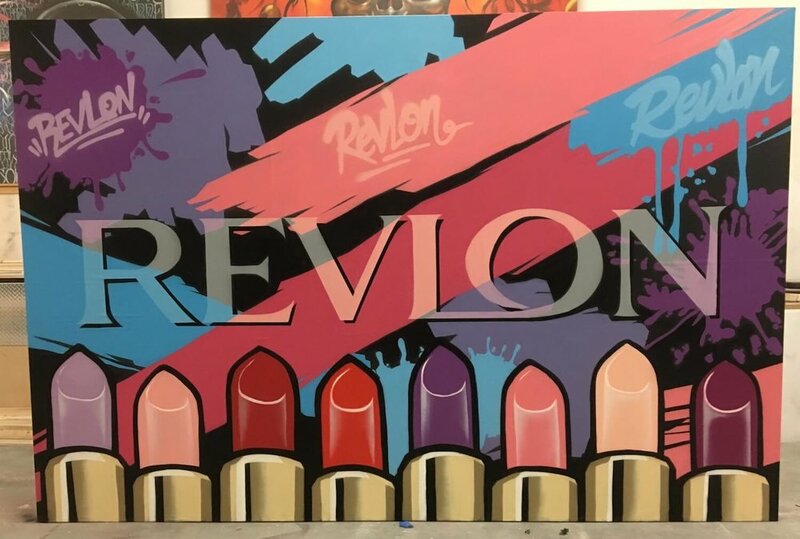 Our artists recently created this vibrant step and repeat photo backdrop for a Revlon beauty conference in Hollywood, CA. This canvas was painted 'live' by one of our graffiti artists for hire, at a large event in downtown San Francisco. The event was attended by over 3000 guests whom were excited to watch three of our graffiti artists in action as they created live artwork before their eyes during the four hour event. Pictured is one of our graffiti artists in action as they paint live during a large 3000+ people event overlooking the San Francisco downtown skyline. Simple typography mural painted inside a tech office in Silicon Beach, Los Angeles 2016. Colorful Lettering graffiti mural painted in Silicon Beach, Los Angeles. New exterior graffiti mural painted in Santa Monica, Los Angeles. New office graffiti mural painted in Venice Beach, Los Angeles, painted in 2016. New Typography Mural painted in Venice Beach, Los Angeles 2016 by one of our amazing graffiti artists. This is an outdoor graffiti mural at the SoMa office of travel tech start-up company Bluesmart. It is featured in their courtyard where staff have meetings and where the team BBQ's on weekends. Bluesmart commissioned our mural agency to create two inspirational graffiti murals to enhance their outdoor space. This piece was inspired by two of the companies motto's "travel more" & "explore more". Before the murals were painted, while the layout of the space was very appealing, the vibe was was lacking. 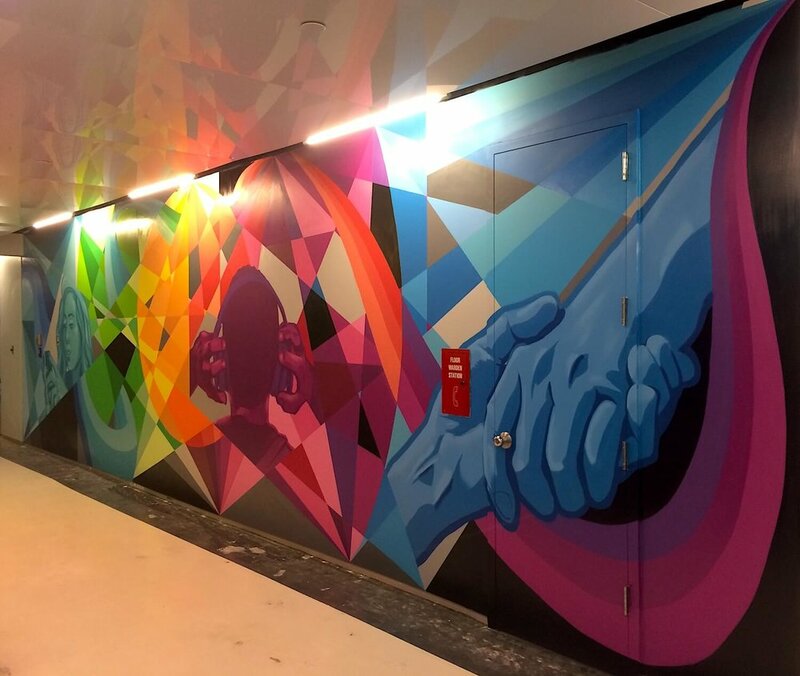 We added two street art murals to the space and the energy completely transformed into an inspiring space full of color. 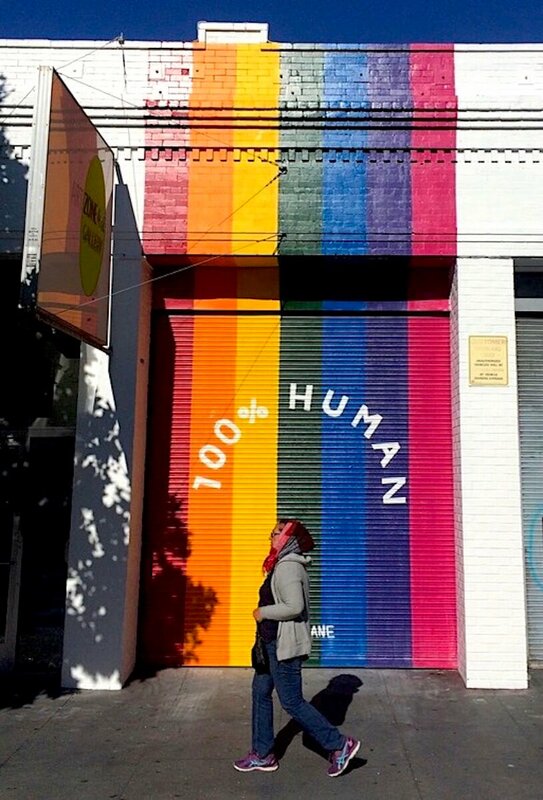 This custom mural echoes the company’s values and they were very happy with it. 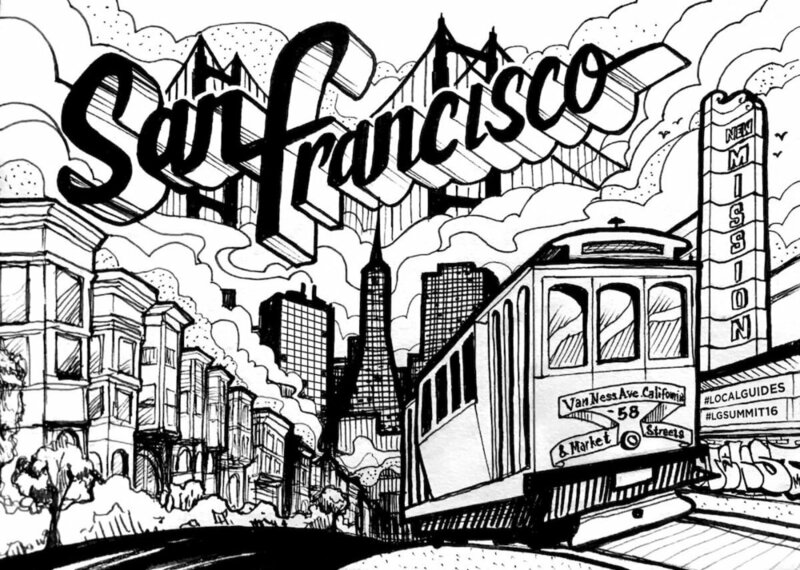 Commissioned in San Francisco, CA. This is the second graffiti mural painted for the Bluesmart, a travel tech start-up company in SoMa, San Francisco. Bluesmart commissioned our mural agency to create two colorful graffiti murals to enhance their outdoor space. This mural is located in the courtyard of their office where they work, socialize and BBQ. We were hired to creatively weave their company values & "Passion for Travel" into this particular style of urban contemporary art. Each aspect of the painting has specific meaning to the company. We love commissions like this. 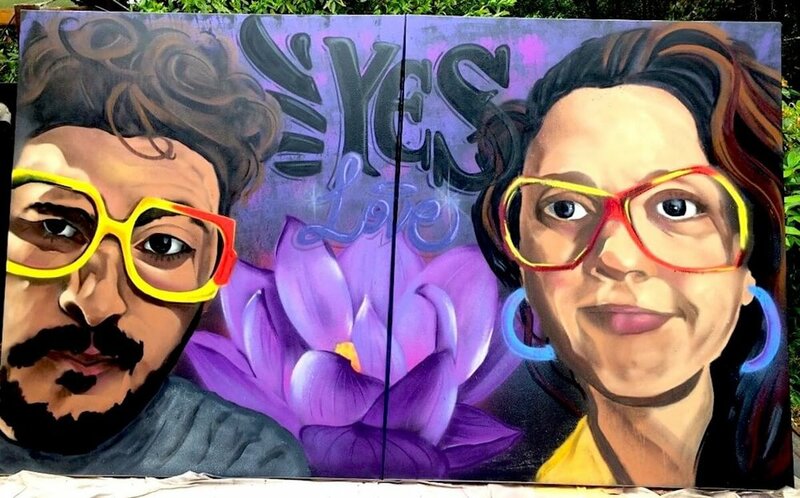 Our mural agency’s creative director, Rye Quartz, painted this street art mural at the annual art festival “Art Basel” in Wynwood, Miami. Longchamp created an ad campaign around the street art murals and featured this mural in their campaign. This is a large-scale mural, approximately 120' x 20'. Art Basel is an exciting week where urban street artists and graffiti artists from around the world fill the Wynwood arts district with amazing murals, street art, graffiti and contemporary art. This geometric mural style is one of Rye Quartz’s favorite styles that he is often commissioned and hired for. This style of artwork is one that our lead artist, Rye Quartz, loves to paint, is known for and is often commissioned to create! This unique street art mural project Byens Hegn is funded by the Copenhagen Metro as part of their mission to give their new metro line construction sites a makeover. This large wall was blocking the view of restaurants and storefronts on one of Copenhagen's popular dining streets, so our mural agency was commissioned to create a mural on the wall which positively transformed people's experience of the space. This is a large-scale mural that is approximate 60' long and 10' high. Located in Copenhagen, Denmark. What you’re looking at here is a street art styled ticket booth for a popular music festival in Denmark called “Trailerpark Festival.” The event commissioned our mural agency to turn an old, broken down trailer into a cool piece of art that would represent the funky street art style of the festival. 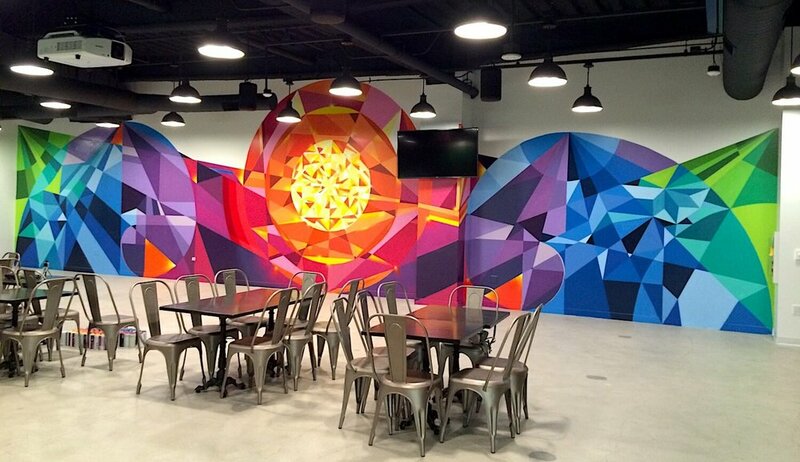 Our lead artist was inspired to integrate imagery from their logo into an overall abstract, contemporary mural. The result was amazing. Event-goers were so excited as they approached the ticket trailer to pick up their tickets, taking photos and posting to Instagram. Located in Copenhagen, Denmark. This contemporary street art mural is located in the SoMa office of tech-start up company Riveria Partners. 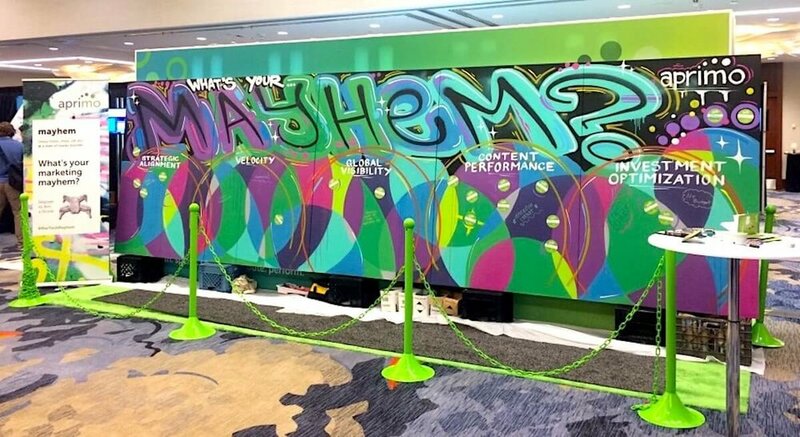 While undergoing an interior decorating makeover, our mural agency was commissioned to paint an abstract street art mural that featured their client’s logos along with a loose interpretation of their own. 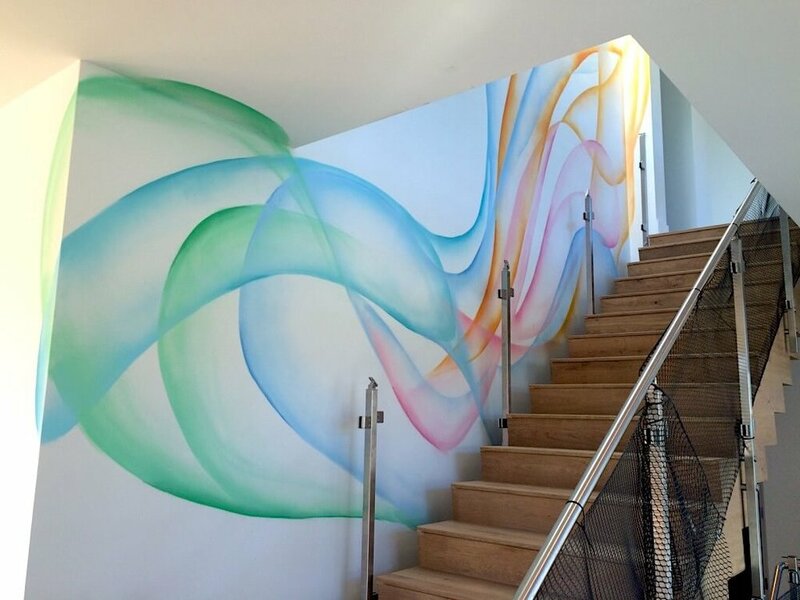 They wanted a simple urban contemporary art mural that would stretch the wall space of the stairwell and lead staff and guests up the stairs into their office. Located in SoMa, San Francisco, CA. This 3-D anamorphic graffiti mural lives in the Scion showroom in the San Jose. Our mural agency was commissioned to create an interior mural stylized with a gothic, apocalyptic city scene and with a car as the main feature. 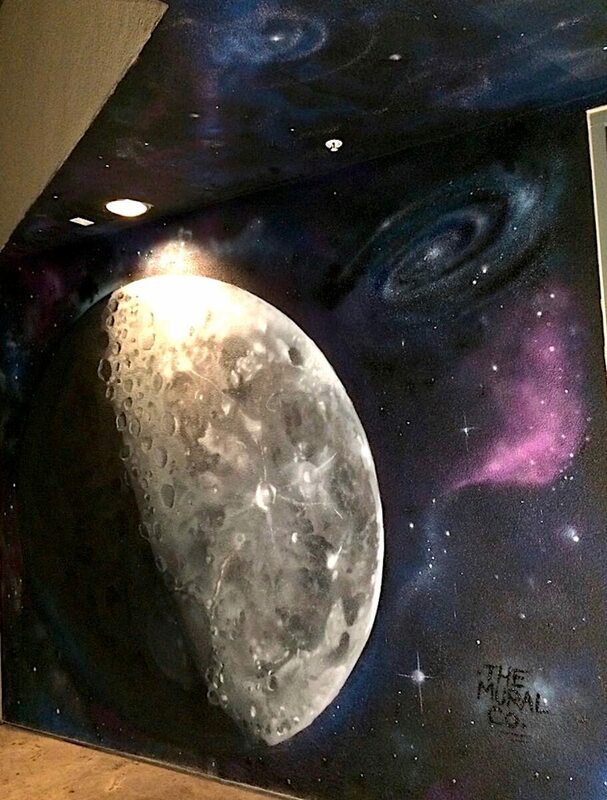 However, we took it one step further by offering to paint not just a car on a wall, but an anamorphic mural (3D optical illusion) with the car across the corner of these two walls and appearing to come out of the wall when viewed from the front door. We are always motivated to do the best we can to create the most amazing mural for the space, and while it would have been easier to paint a flat image of a car, it excited us more to paint an awesome, realistic styled anamorphic mural. We knew that the 3D mural would engage their patrons as they entered the door to their new showroom. We were thrilled with the result! Located in San Jose, CA. This is one of our favorite interior office murals! Techcode, a global tech company, hired our mural agency to paint an large-scale interior mural on their Silicon Valley office wall. The intention was for the mural to transform the space and add lots of life. They wanted us to blend our signature geometric style with their branding and logo. The vertical lines in the painting is closely based on their logo. This office went from blank white walls to a huge, captivating custom mural just right for the space. They were on a very tight deadline, and we were happy to be able to get it done in time for them! Commissioned in Silicon Valley, Mountain View, CA. 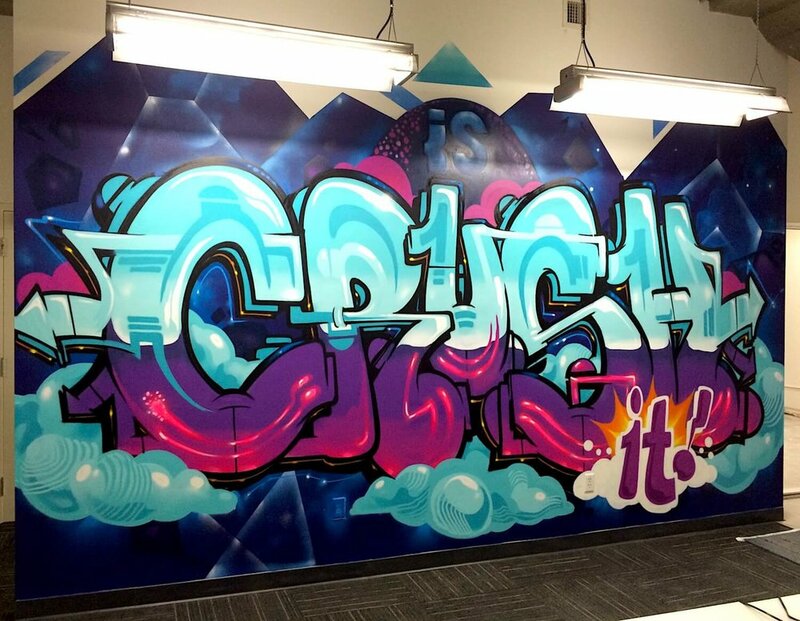 This graffiti street art mural lives in the conference room of tech company Betterworks’ Silicon Valley new office. Before moving into their new office, Betterworks hired our mural agency to transform the space by adding life and vision to three particular spaces. You can probably imagine how big our smiles were when they told us they wanted us to paint graffiti in their office! We love painting all styles of urban art, but graffiti is especially fun and how we began. Furthermore the graffiti artform originated in New York in the 1970's and 80's. 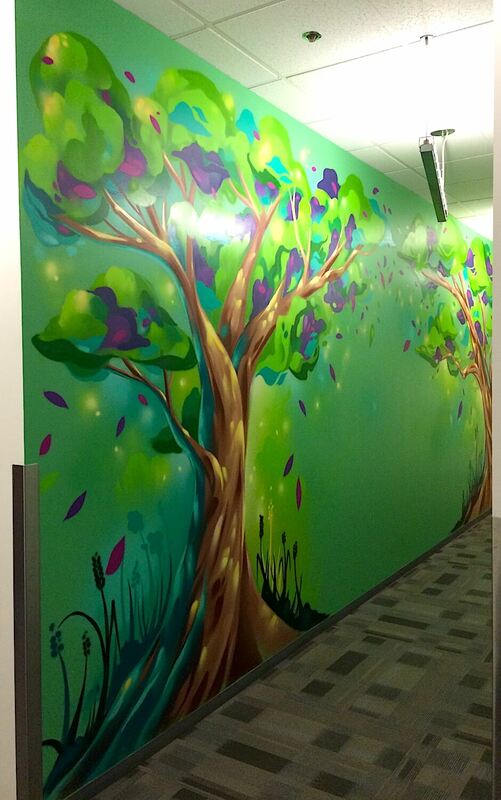 This mural is a great change of energy for the office environment and they were very happy with how it turned out. This mural is one of three commissions for their new Silicon Valley office. Within the company, this space is called “The Brooklyn Room, which is a reference to their NY office." Located in Redwood City, CA. 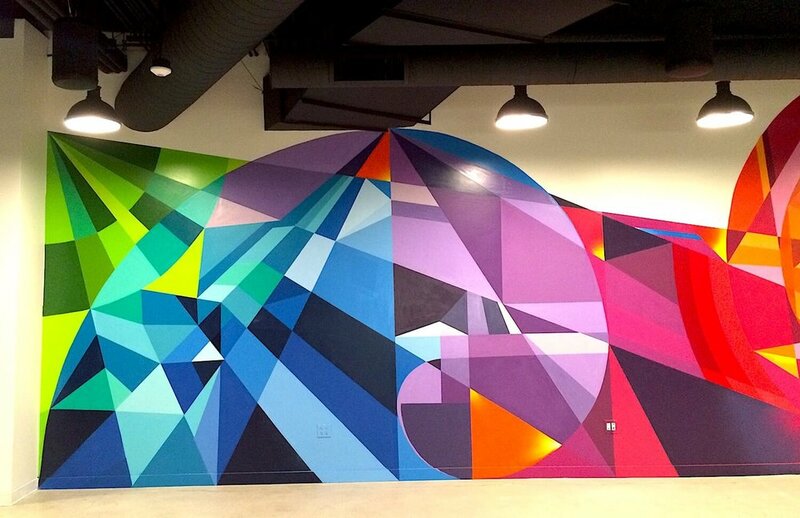 This geometric graffiti mural is one of three commissioned pieces for Silicon Valley based tech company Betterworks. Before moving into their new office, Betterworks hired our mural agency to transform the space by adding life and vision to three particular walls. Betterworks asked us to create a simple geometric piece that was inspired by their teams connection to Soul Cycle. Betterworks have their own spin on this, - "goal cycle" which is part of their motivational program for staff. The mural was inspired by Soul Cycle imagery, abstract references to reaching the peak and painted in their branding colors. Located in Redwood City, CA. 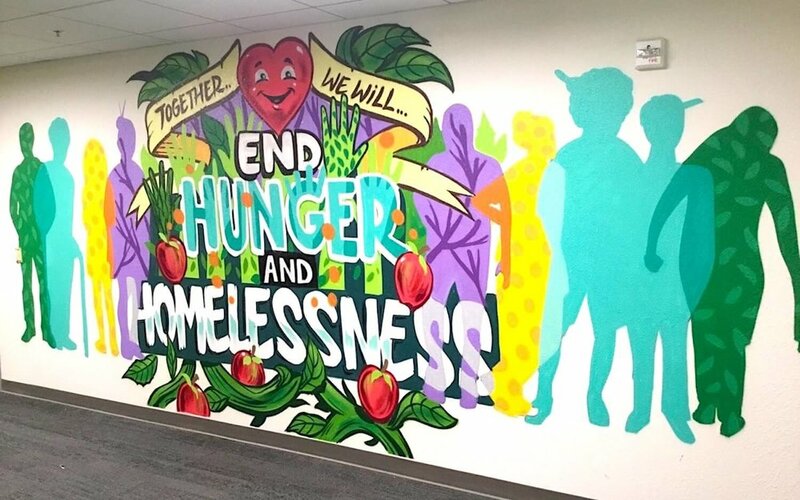 This street art mural is known as the “Vision Wall” in the new office of Betterworks, a Silicon Valley based tech company. Before moving into their new office, Betterworks hired our mural agency to transform the space by adding life and vision to three particular walls. For this wall, the company gave us specific imagery to work with, inspired by their company culture, branding, and values. We love having the chance to paint multiple walls in a space because it gives us the chance to enhance the transform the interior in a massive way. Sometimes, one good mural is all that it takes. 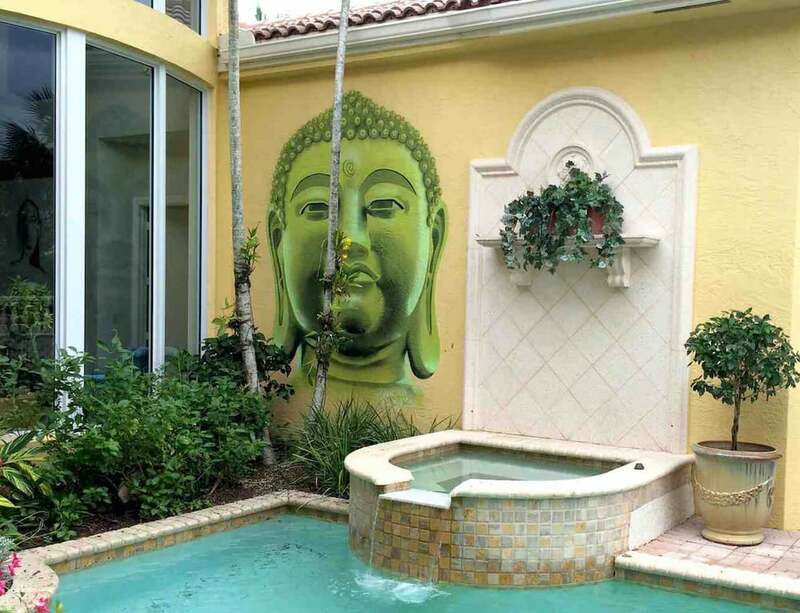 Other times, a space is best with multiple murals painted. If you’re not sure what you need, we can help you figure that out. Located in Silicon Valley, Redwood City, CA. We are very happy with the outcome of this street art mural. Painted in the interior office of tech start-up company Chronicled in their SoMa office in San Francisco, this graffiti mural added a ton of style to an otherwise blank space. 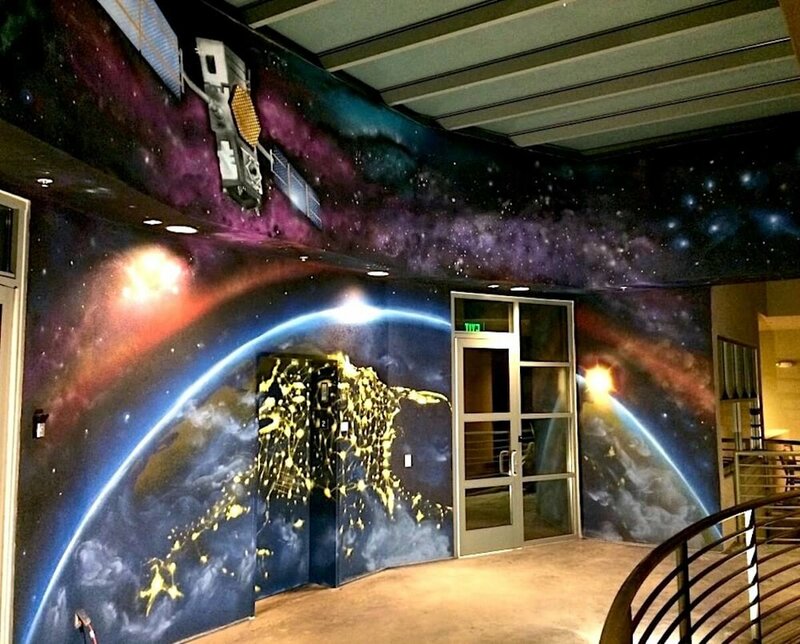 The company was stoked to see their interior decor completely transform by adding this mural to their main office wall. This was a great mural commission. We drew inspiration for the patterns from sneaker designs, as Chronicled is a sneaker & clothing tech company. We’d say this particular style of graffiti artwork falls under the category of “contemporary urban art.” Our mural agency was commissioned to create an abstract piece that integrated their branding into a cool graffiti style mural, and this is what we created. If you love this style, let us know and we can completely customize it to your branding and vision! Located in SoMa, San Francisco, CA. Creating a San Francisco Bay Area floor mural at Levi's Stadium was fun and also a good challenge at this scale of 20' x 20'. The idea was to represent all the communities which make up the Bay Area fans of the San Francisco 49'ers. Our mural agency is native to the Bay Area and we love integrating local culture, geography, and nature into our artwork. This graffiti floor mural was inspired by classic typography and graffiti styles. We used special paint products to ensure that this mural was protected even with the thousands weekly foot traffic at the stadium. Located in the South Bay, Santa Clara, CA. This is our geometric graffiti floor murals painted for the BudLight Patio at Levi's Stadium. This graffiti mural was one of four mural installations that our mural agency was hired to create. This style of artwork is one that our lead artist, Rye Quartz, is often commissioned for. We were excited that the client wanted us to extend the digitally designed wall mural onto the floor, it created an awesome effect and we were inspired by the idea of creating a reflection Located in the South Bay, Santa Clara, CA. Painting a commissioned piece at Levi's Stadium, where the 2016 Superbowl will be held, was an amazing experience. This large-scale outdoor geometric mural was painted for George P. Johnson (GPJ) as part of their activation of the BudLight Patio. Everyone was excited to bring street art into the stadium and amazed at how the mural brought the area to life and enlivened & enhanced the patio. It is great to see how event-goers continue to get excited by the art and engage with the space! This graffiti mural was one of four geometric installations our mural agency was hired to create across the patio. The artwork was inspired by football strategy drawings. This style of artwork is one that our lead artist, Rye Quartz, is often commissioned for. Located in the South Bay, Santa Clara, CA. We were so happy to create this colorful abstract mandala mural for nonprofit 109 World’s launch event in Berkeley. This large-scale mural was mostly painted before the launch event, with the finishing details added live during the event to excite event-goers and activate the space. We were inspired by their nonprofits values and mission and integrated their social mission and philosophy into the art. At the end of the event, the attendees posed in front of the mural for a group photo. Our mural agency was honored to be a part of this event! This spray-paint logo mural lives in the office of SoMa based tech start-up Squad Sports. 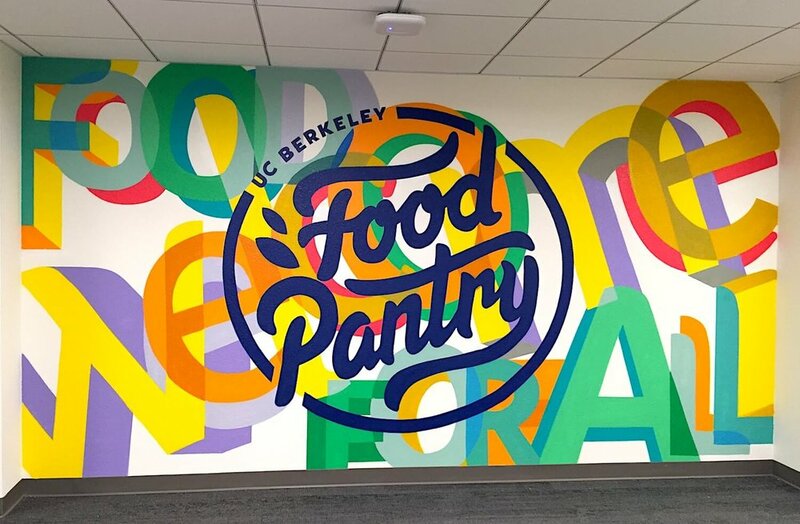 They hired our mural agency to paint a graffiti inspired version of their logo in their entryway, which is the first thing you see when you walk into their office. The graffiti mural is actually painted on a reclaimed piece of timber flooring from a Bay Area basketball court which has been installed on their wall. Because of that we decided to paint a basketball bouncing out of their logo. Located in SoMa, San Francisco, CA. In Boulder, CO, there is a famous late-night restaurant and cafe called Fat Shack that caters to college students. The company hired our mural agency to create a street art inspired graffiti mural on their main restaurant wall to add some fun and energy to their dining area. Our lead artist was inspired to create a piece of art that would feature their name is fat, funky and bold lettering along with cartoon characters of their condiments and their best selling menu items. 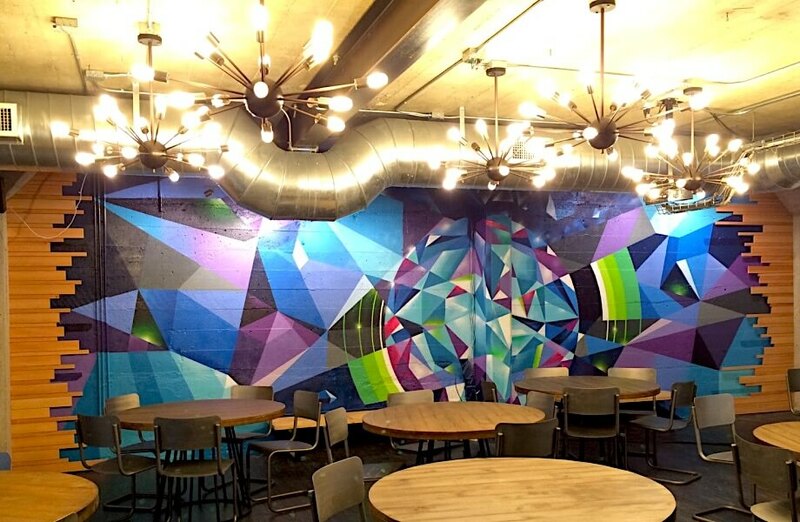 The commissioned, custom graffiti mural completely transformed the space and created fresh and playful atmosphere for customers.